1. Chiropractic Care is more expensive: Multiple studies have shown that this is not true. A study conducted in 2010, published in the Journal of Manipulative and Physiological Therapeutics, showed that when care was initiated by a doctor of chiropractic, for patients experiencing low back pain it was 20% cheaper than when initiated by a medical doctor. Nine out ten patients with a back or neck condition will think that seeing a medical doctor first thinking they will offer a solution. Prescribing muscle relaxers and anti-inflammatory medication is cheaper but it is not a solution, it is a cover up. If the medication does not work the next medical step is seeing a physical therapist. Depending on your insurance benefits and deductibles you will be paying $30 to $120 a visit to see a physical therapist. If the stretching and exercises don’t work, the next medical step will be pain management. Depending on your insurance benefits and deductibles you will be paying $80 visit to $5000 for a series of pain treatments. If the pills and shots fail to cover up the pain while your condition gets worse. The next medical step is a MRI and a trip to the surgeon. When combined with surgical costs, medications, magnetic resonance imaging (MRI), rehabilitation and disability, the average spine surgery case approaches $100,000 or more. The direct costs are astronomical and may reach as high as $169,000 for a lumbar fusion and $112,000 for a cervical fusion. Now this is getting expensive but remember someone said chiropractic is expensive. Lets talk about expense. What will it cost you for lost wages because you can’t work because of your pain? Patients who see a chiropractor first are less likely to gobble up pills, get shot and spinal surgery. They are more likely to recover from their spinal condition and stay working while being treated. When it is all added up, chiropractic treatments are a cheap effective solution. Chiropractic Care is Dangerous: Chiropractic care is inaccurately believed to be more dangerous than standard medical care. Chiropractic care is less invasive than other medical interventions that increase risk for injury. Motrin and ibuprofen has been linked to heart attacks, strokes, and blood clots, all of which can be deadly. Regular use of ibuprofen can damage the lining of your stomach, putting you at risk for stomach ulcers and heartburn. Tylenol is not without its serious complications. It is the leading cause of acute liver failure in the United States, and the drug in some cases led to fatalities. The active ingredient in Tylenol, acetaminophen, accounts for more than 100,000 calls to poison centers, roughly 60,000 emergency-room visits and hundreds of deaths each year in the United States. In England, it is the leading cause of liver failure requiring transplants. In 2009, the FDA issued guidelines for adding overdose guidelines to packages and in 2011, the agency confirmed the link between the drug and liver damage. Lets look at the insurance industry facts please. According to an article in “Modern Medicine”, malpractice insurance for family and general practitioners paid premiums of $12,100, and pediatricians’ premiums averaged $11,800. Orthopedic surgeons pay on the low end $20,000-$30,000 to a $100,000 plus for medical malpractice premium. Malpractice insurance for a chiropractor is a whopping $900 to $1200 a year. It is Unsafe for Children to Get Chiropractic Care: Receiving chiropractic care as a child is widely believed to be dangerous and not advisable. Where are the studies proving this myth? The truth is, research has shown that it is not only safe, but also recommended for children as young as babies to see chiropractors. Being as active as they are, children are susceptible to injuries that can impact the functionality of their neck and back. Chiropractors adjust their approach when working with children, ensuring that they are as gentle as possible. The best time to address spinal conditions and misalignments of the spine is when the child is young and before the child stops growing. Chiropractors aren’t REAL doctors: We are all programed to think a doctor is a doctor when they give you a shot or a pill. Most people are aware of the delicate nature of necks and spines, and therefore only want to entrust their care to a doctor that is properly accredited. Medical doctors do not have the training in care of the spine like chiropractors do. Chiropractors are highly educated and highly trained. In most states, they must have four years of pre-medical undergraduate education in the sciences before attending chiropractic college. Next, they must complete five years of medical and chiropractic science studies at a nationally accredited chiropractic college. Chiropractic students must complete AT LEAST 4,200 hours of study, combining time in the classroom and laboratory and clinical experience. They must pass national board exams before applying for state license. This breadth of education prepares chiropractors to treat the variety of cases they see. Once a chiropractor has been licensed they are required to take continuing education classes to keep their license. What makes a doctor? Is it the education or the practice? Once you start you have to keep going: Everyone is afraid of making commitments, especially financial ones, and no one wants to hear that once they see a chiropractor they will have to go for the rest of their lives. But no one has a problem with taking a pill or pills the rest of their live. Do you stop brushing your teeth after seeing the dentist? Do you stop going to the gym or working out once you get into shape? Taking care or your spine is like taking care of your teeth. Keeping your back healthy is the same as keeping your body in shape. The chiropractor will develop a targeted treatment plan after identifying what is causing your spinal problem. This plan includes the number of sessions the chiropractor believes you will need to complete the care and improve your spinal health. If you are seeing a chiropractor for conservative maintenance, you are making a wise investment in your long-term health. Consider it in the same way you would eat healthy foods or exercise, the choice to continue going is up to you. Adjustments hurt: When someone is experiencing back pain the last thing they want to experience is worsened pain in the chiropractor’s office. If your chiropractor is performing an adjustment correctly, it should not be painful. Though there might be some brief discomfort, this has to do with your presenting injury and not the adjustment itself. Generally, patients feel relieved and comfortable after an adjustment. Chiropractors are only helpful for back pain: Chiropractors are well known for helping people with back pain, but it is only one of the many conditions they treat. You can see a chiropractor for a range of conditions, or even if you feel fine but want to prevent future problems and promote wellness. Patients experiencing headaches, shoulder pain, carpel tunnel, heart burn, ear aches, knee pain, jaw pain, neuropathy, chest pain, hip pain can get relief from seeing a chiropractor. Chiropractors can also be helpful with improving your immune system, though the results vary from patient to patient. When the nervous system is functioning at its optimal level, you will feel the difference. Adjustment grinds and cracks your bones: Where is are the studies to validate this statement? This falsehood stems from the noises that are made during adjustments. These popping sounds are not your bones cracking or grinding, but the release of gas bubbles between joints. When you crack your knuckles you hear the same sound. The noise is from the pressure within the joint changing, not your bones being damaged. A good adjustment is always accompanied by this sound. Cracking your back yourself is the same thing: This falsehood is particularly frustrating considering the above information about the advanced training each chiropractor has to receive to be able to practice. This training enables chiropractors to have an understanding of the sensitive nature of joints and how they function. Just because you hear a noise when you crack your back at home does not mean you have achieved the same results as a carefully orchestrated spinal adjustment in the chiropractor’s office. The crack you hear and the bone you feel moving is the hyper mobile one, the one you what to move is the fixated one that the chiropractor moves. By moving it yourself you run the risk of causing more harm than good. Leave the adjusting to your chiropractor. There is no proof it works: This is the biggest pile of B.S to date. Chiropractic has been in the business of helping people get back their health for over a 100 years. If it did not work it would not be in business today. Countless studies in recent years have shown the efficacy of chiropractic care. A study conducted by AV Med, the largest medical health maintenance organization in the southeastern U.S., examined the first 100 patients seeking help at the Silverman Chiropractic Center. Of the 100 patients, 80 had already been treated medically without results. After receiving chiropractic adjustments, 86% had their conditions corrected, none needed surgery, and none felt worse. Though this is just one study, there are others that show similar effectiveness, debunking this myth. If it does not work, then why is the Veteran Administration actively referring veterans to chiropractors? 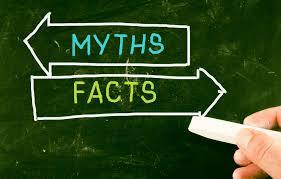 If you were reluctant to visit the chiropractor because you believed one of these myths just listen to your friend or family member that has been urging you to see a chiropractor.